New book, 80 pages, SS10221. The North American B-25 Mitchell was one of the premier US warplanes of World War II. It gained immortality early in the United States involvement in the war when a small group of B-25Bs under Lt Col. Jimmy Doolittle took off from the deck of the USS Hornet and executed a surprise attack on military targets on the Japanese island of Honshu. 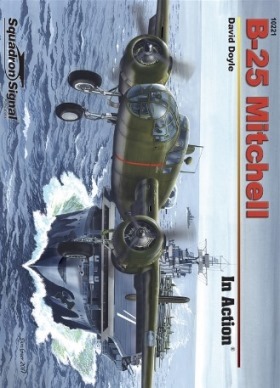 Subsequently, Mitchells would see service in every theater of war, doing duty as a tactical bombers, coastal patrol aircraft, photo-reconnaissance and photo-mapping planes, and, when fitted with additional guns and rockets, as a superb ground- or shipping-attack platforms. The US supplied B-25s to the British Royal Air Force and to the Soviet Union, which flew them against the Nazis on the Eastern Front. The career of the Mitchell is covered from the experimental NA-40 prototype to the final production B-25J model and also US Marine Corps PBJ versions. Eight all-new pages of photos and information fill out this latest edition. Illustrated with 225 photographs, more than 80 of them rare period photos in original color, plus color profiles and detailed line drawings.